It seems like I always have a ton of leftover rice. Duh! 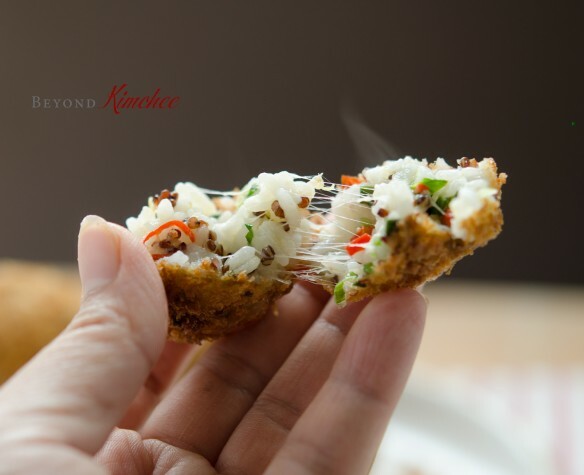 So here I am throwing a simple yet very tasty snack, appetizer, or finger food that you can make easily with leftover rice. You have to use short grain rice, though. You will need the stickiness from the short grain. Mix rice with vegetables and cheese. I used Italian cheese mix, but any melt-able cheese will work. UPDATE: I forgot to mention to add some Parmesan cheese in the mixture. Rolled them into golf ball size. ..then roll them in Panko breadcrumbs. Fry them in oil until golden brown. 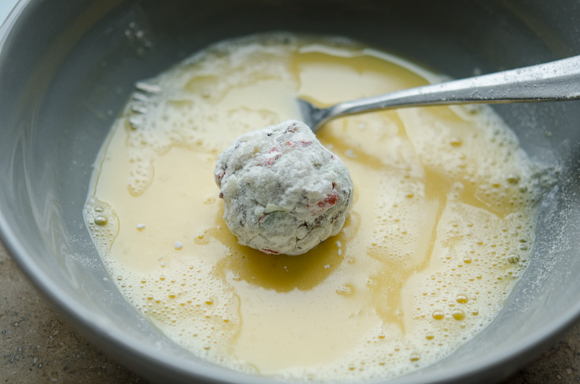 If I used mozzarella cheese, the rice balls would have that oo0y-goooy melted cheese stretching out. But Italian cheese mix offers a very good taste. Bite into one. 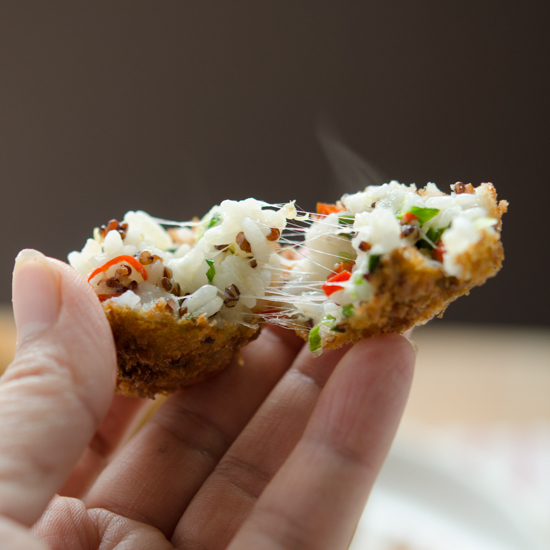 You will love the way it is or serve with warm marinara sauce. That would be divine! Hope you enjoy these rice balls! It is the summer season again. For me having a gypsy-like life but without the tent to carry along, I am leaving again to look for another adventure in a country I’ve never been to. In other words, I am moving again. Where? I will let you know when I arrive. Hopefully everything will arrive safely in one piece. I was told that 1/2 of my belongings are in a random warehouse in Belgium, and the other 1/2 is in US. And my destination this time is not close to neither of the location. I just hope that all my possession comes in one piece without the missing pieces. When I moved to Malaysia last time, my sofa arrived safely but without the cushions, and nobody knew when/where they lost the cushions. Maybe they are still floating somewhere in the pacific ocean? Who knows? Ahhhh, the joy of moving! Until I see you again in whole, have a great summer, my dears. I will keep up the postings with travel, but recipe posting might take some time. 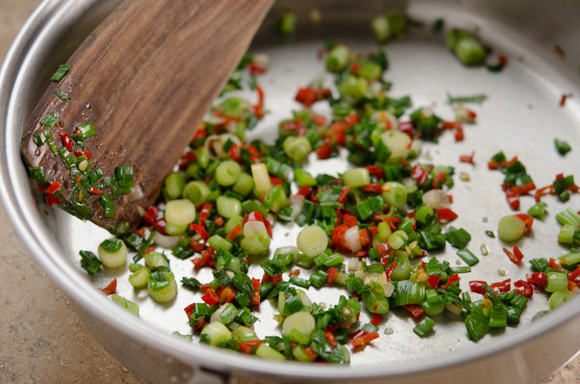 Heat 1 teaspoon oil in a skillet over medium heat and saute green onion and red chili for 30-60 seconds to wilt seasoning with salt. In a mixing bowl combine rice, green onion and chili mixture, cheese. Mix well and from into small balls. 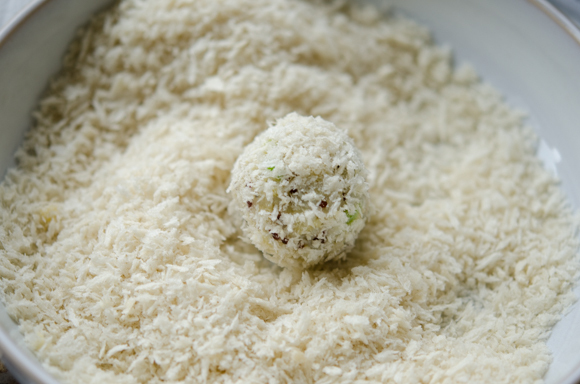 Roll the rice balls in flour, egg and breadcrumbs. Heat oil in s small pan over medium heat until hot. 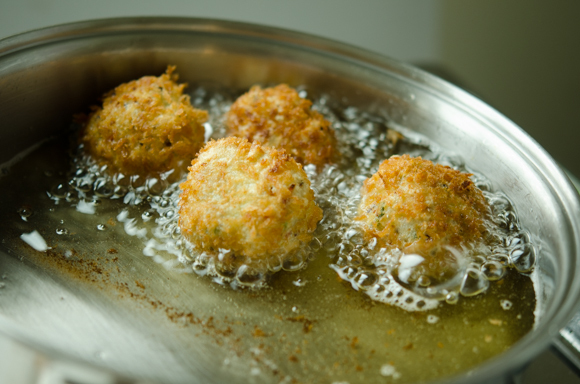 Deep fry the rice balls until the crust gets golden brown. Adjust the heat so the rice balls don't get brown too quickly. Serve hot as is or with marinara sauce. 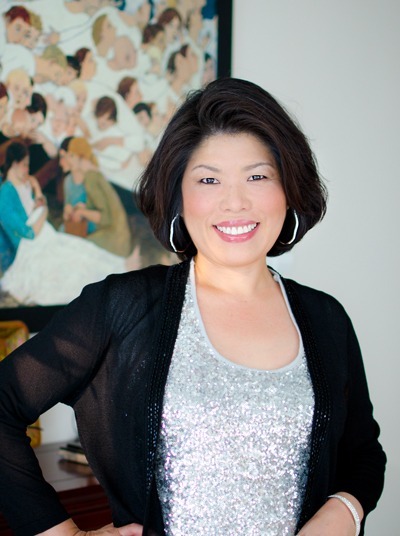 Have a safe move, and I look forward to hearing more of your recipes! 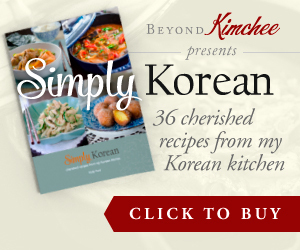 I made both your mak kimchi and your spicy bean sprout salad recipes this past weekend, the kimchee for the 3rd or 4th time - love how easy it is! My whole family loved the bean sprouts, so I will be making them again this week. Nom nom! I often fry in a wok so I don't have to use too much oil. These look great! 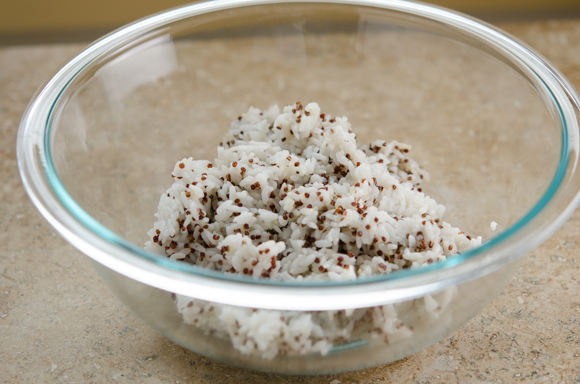 Love the idea of the added quinoa in your rice. Good stuff -- thanks. Οι μπαλίτσες μας προκαλούν να τις δοκιμάσουμε! Καλό ξεκίνημα στο νέο σας προορισμό ! Another brilliant recipe! I love the colourful mix, including quinoa :-) Wishing you a smooth move and transition to another country, Holly. I too know the joys (:-) ) of gypsy living. 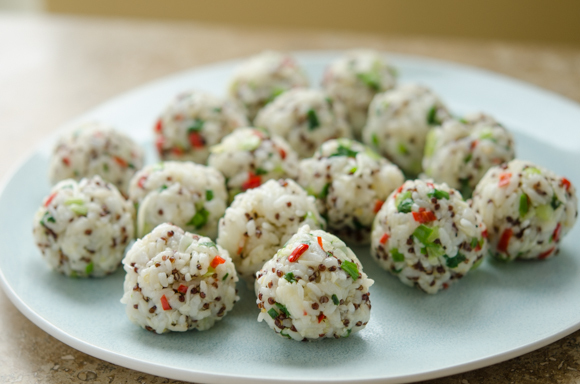 Oh, these cheesy rice balls look tasty indeed! I look forward to hearing more about your upcoming destination. Have a safe trip!! Moving is definitely a pain with all the packing, unpacking, and reorganizing of everything. Blah! These rice balls are such a cool idea! I`m a huge panko crumb person! Thanks Lynna. Moving is indeed hectic and stressful but at the end, I can relax and enjoy the new adventures! I really like how the quinoa and veggies contrast with the white rice. 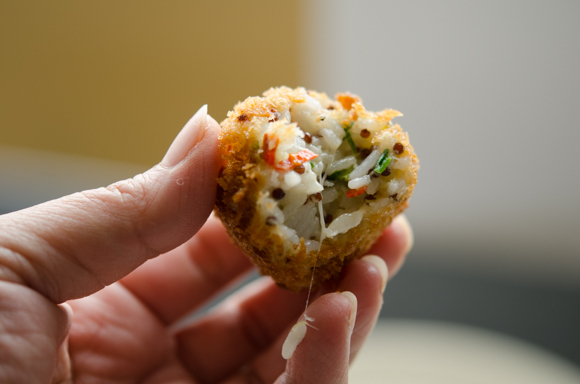 These little rice balls are like work of art - so delicate and beautifully coated in breadcrumbs! I would love to have a couple of these right now! Holly- thank you so very much for this amazing recipe! I made these tonight for my family and we all loved them! My kids couldn't get enough. I ended up preparing another pot of rice for tomorrow! Thanks!! I like this recipe and will try it soon. I always enjoy it here, even though it's been a long time. I am glad you are still around. My life had an unexpected turn. Good luck on your move. Great to hear from you, Lyndsey. I hope everything is turning out great for you. 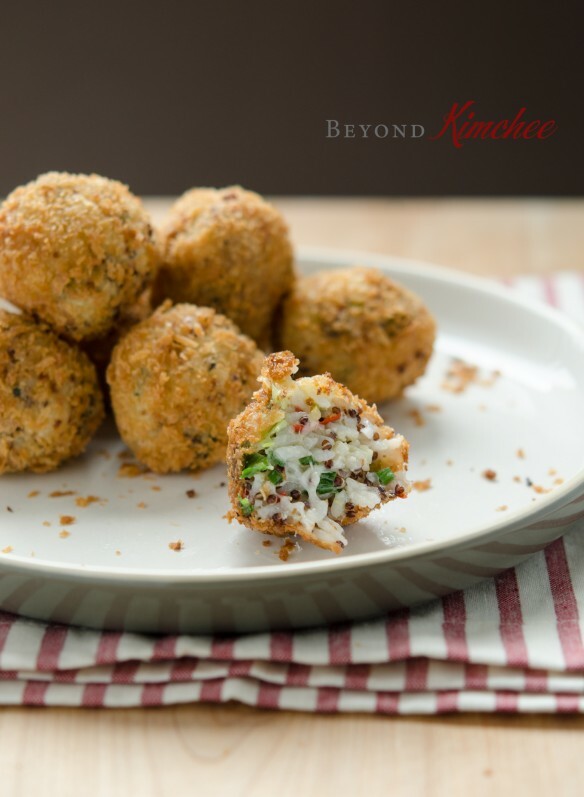 I love the creativity of these cheesy rice balls! The kids will love these this summer. Great for road trips and the beach. Thanks! I've tried your peri peri chicken recipe and and it was spot on, can't wait to try this one. 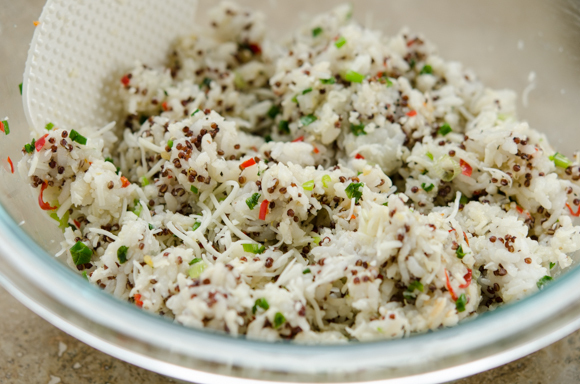 Adding quinoa when you cook rice, that's a good idea! I'll try it next time I cook rice. I made this tonight for a family dinner and everyone liked it. I used brown rice instead of white rice and it worked just right. Thanks heaps for the recipe. Will definitely cook this again. Very easy to make and tasty. I just wish my kitchen wouldn't look like a battlefield every time I fry stuff.